Rajasthan is rich in culture and heritage and is full of festivals. Rajasthan is famous for lakes, desserts, palaces, forts, monuments and vibrant markets. Rajasthan is the place which attracts large number of tourists from all around the world. 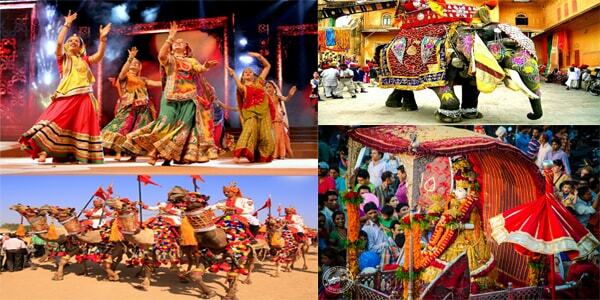 There are some colorful and popular festivals of Rajasthan to experience culture and tradition of Rajasthan. Teej : Teej is the most popular festival in which Women in Rajasthan fast for marital bliss and this festival plays an important roles in the lives of women. The festival is celebrated in the honour of Parvati also known as Teej Mata. In this festival women adorn themselves with the jewellery, dance and enjoy swing. Ghewar is prepared specially on this day and is served as Prasad. Pushkar Fair : Pushkar Fair is celebrated every year in the month of Kartik. The fair is considered a s the largest platform to buy and sell camels, cattles and horses. This festival also gives witness to the performances like camel dancing and other various things. Owners decorate camels with jewellery, paints and cloths. On last day, music performances and live dance are organised to enjoy the culture of Rajasthan. Mahashivratri : Mahashivratri is celebrated in all over India. Lots of myths are associated with this festival. In this festival, Lord Shiva is promoted with honey, bel leaves and flowers.Women keep a fast on this day. Celebrations takes place all over the night and people sing devotional songs. People also takes a dip in the holy river Ganga. Navratri : Navratri is considered as most auspicious 9 days of Hindu Calender. It is celebrated with great fervour in Rajasthan. Worship and fasting takes place in the daytime and the nights are celebrated with dancing. Elephant Fair : Elephant festival is celebrated on the day of holi and it is one of the most traditional festivals of Rajasthan. In this festivals elephants are decorated with colorful swings, heavy jewellery.